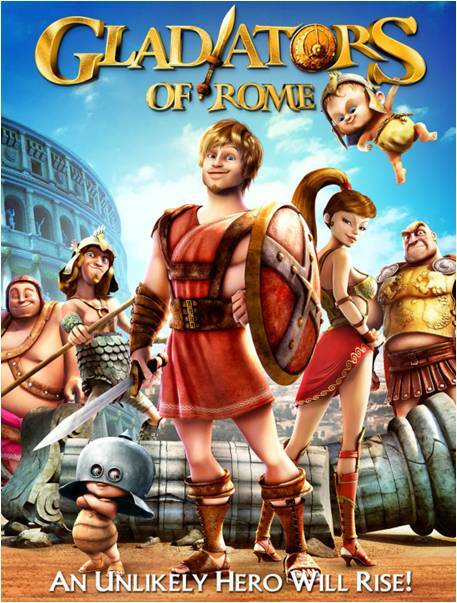 HOLLYWOOD, Calif. – From writer/director Iginio Straffi (“Winx Club”) GLADIATORS OF ROME makes its DVD debut on February 17, 2015 from Paramount Home Media Distribution. GLADIATORS OF ROME tells the hilarious story of an unlikely hero during the golden age of the Roman Empire. The delightful animated adventure follows Timo, a student at the Gladiators’ Academy in Rome, who has no desire to become a legendary gladiator like his stepfather. That is, until the mesmerizing Lucilla walks into his life. With the help of an unlikely band of sidekicks, Timo is determined to be the gladiator of her dreams and embarks on an action-packed journey to become the Colosseum’s first victor! The GLADIATORS OF ROME DVD is presented in widescreen enhanced for 16:9 televisions with English 5.1 Dolby Digital, French 5.1 Dolby Digital and English, French and Spanish subtitles. The DVD includes the feature film in standard definition.